Magnolias and Men M/M Romance With a Southern Accent: First Review of Duet, 2nd Edition! It never fails. Whenever a new novel publishes, I'm very anxious about how it will be received. Then the reviews come in. "It is with skill that Winters has created the characters of Aillil and Malcolm and she presents two wonderfully drawn characters in them. Here is a story that shows that fate is just that, fate and it cannot be fought against." "Here is a wonderful love story that spans time and place and that contains history and contemporary living." 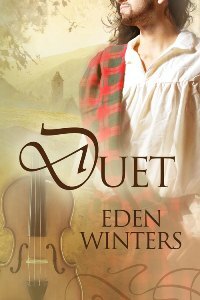 Find Duet at Dreamspinner Press, now available for preorder. The story publishes on Monday, February 18.